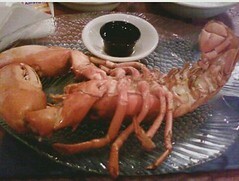 Had to have the lobster when I met my niece for dinner at the Tiger’s Tale in Montgomery the other night. Their service was great; I always enjoy myself there although I usually stick to a burger. The lobster was split (sorta) and broiled, although I guess it was also boiled first because there was a lot of water in the claws. To me a broiled (or grilled) lobster should be split uncooked (yukky I know, but you can mercifully dispatch it first), and then broiled or grilled. It was still good, as was the hot crab dip and salads that preceeded it (much of which went home with us). My niece even had the peanut butter pie for dessert, I tried a bite and while it tasted good, found it very, very, sweet. Ahhh, to be in my 20s again with not a (dietary) care in the world! It’s so much fun to have dinner with her and soak up some of that youthful enthusiasm! Love ya!